It's been a while, but I finally managed to get my converted squad of Death Korps of Krieg Grenadiers done. The squad is for my friend who plays IG and he has been waiting patiently for some time now for me to finish this unit off. I think he's going to run them as regular Imperial Guard, but I'm not exactly sure how he's going to incorporate them into his army. Either way, I built them as a challenge for myself to see if I could do something this involved. He was kind enough to provide me the bits to practice on. 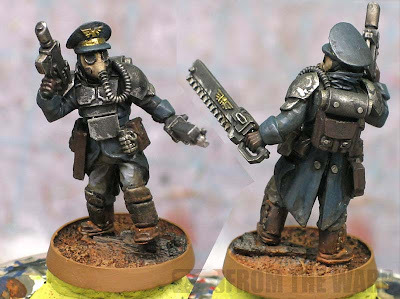 In the end, I think they are close enough to be seen as Death Korps models. They aren't exact by any stretch of the imagination, but I feel like I managed to get enough of the major characteristics to make them easily identifiable. A little while ago, I posted the "how to" for converting these guys. Now that I have the squad done, I'll cover a some of the painting I did on them in this post. I have to say they are done to a very basic tabletop level. Nothing fancy at all on these guys. Maybe some soot stains on gun barrels, but that's it. They start with a black prime and basecoat. From there, I lightly drybrushed GW Leadbelcher over a few elements on the model. I focused on the gun and armour plates. This allowed me to weather them fairly quickly without worrying about the rest of the model. Meaning it didn't matter if I got metallic anywhere else since I would be covering it with a different basecolor shortly. After that, I moved onto my base colors. A dark blue (P3 Coal Black) for the coat, GW Mechanicus Grey for the pants, old GW Scorched Brown for the leather pieces and old GW Khermi Brown for the gas masks. I added in my metals like the gun barrels and such using GW Leadbelcher again once I had all my other base colors down. With all of my base colors dry, I washed my models using a mixture of 4 GW shades. Nuln Oil, Agrax Earthshade, Seraphim Sepia and Reikland Fleshshade. I used more browns on the lower portion of the model and kept the black up towards the top. All this did was give me some variety overall and tie things together a little bit. Once my washes were dry, I went back in with my base colors and gave the model a few highlights in some key places. 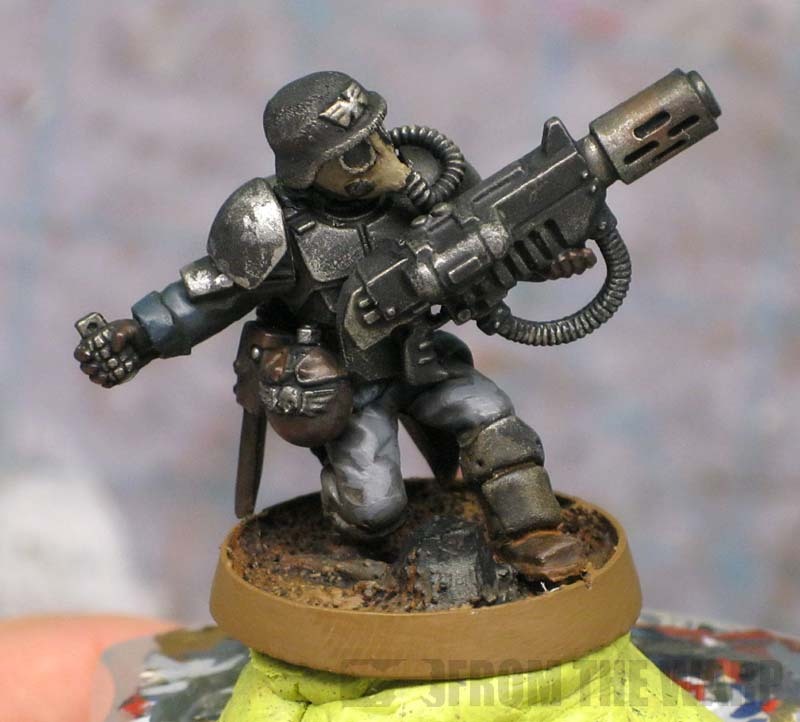 The only model with any other color is the officer who has a tiny bit of gold on him to make him stand out in addition to the hat instead of a helmet. The basing and weathering were fairly quick as well. The weathering on the armour was done in part with the light drybrush of GW Leadbelcher in the beginning. I added some more wear and tear by stippling some more metallic along the edges of the armour plates. 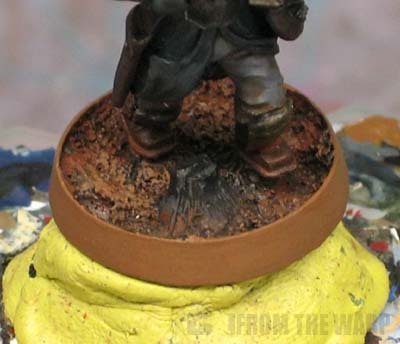 In order to tie the model to the base, I used by mud color and thinned it considerably with water. I used that as a "wash" and applied it to the lower portion of the legs on each model. This helped simulate the mud and dust that would collect along their boots and pants. I have a more involved way of making a mud base, but like I said, I wanted to keep it super simple for these guys. They are on Blasted Wetland bases from Secret Weapon minis which are slightly recessed and would allow me to do the more involved mud base quite easily if I chose to. The last thing I did was paint the rim of their bases a brown that is similar to the mud inside it. I did this t add a little more color to the model overall since they are a very dark unit when see from a distance. I had the rim black at first, but the unit appeared way too dark when you looked at them as a whole. I remember the original post. It's nice to see more of them. The one with the melta throwing the grenade is my favourite. Great work. Congrats. Your friend will definitely be delighted with them. Pass for DKOK? Ron, they are so damn close that they would easily be mistaken at the 3' mark for DKOK. Then, some one will pick them up to get a better look and be shocked by how clever and well done those conversions are. 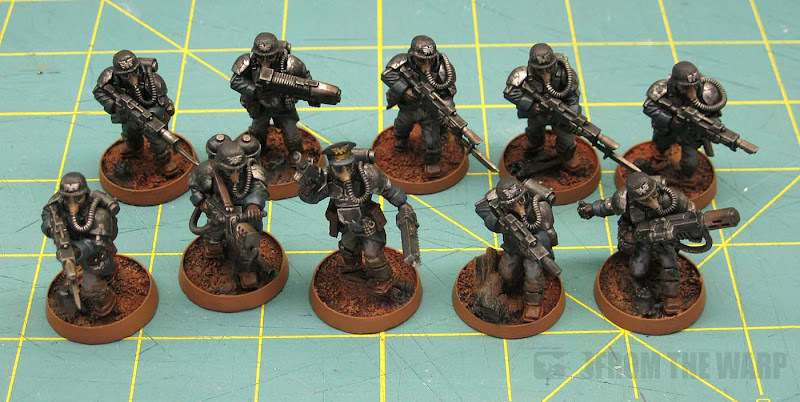 In fact, if you had painted them in tan they would have passed for Steel Legion too. Top notch stuff there man. Those really turned out fantastic, Ron - beautiful work all around! Night Runner: Thanks, I was trying to come up with something different for the second set of crouched legs. I didn't want it to look like there were tow of the exact same pose. Zab: As long as they pass at the 3 foot mark. That would be good enough for me. 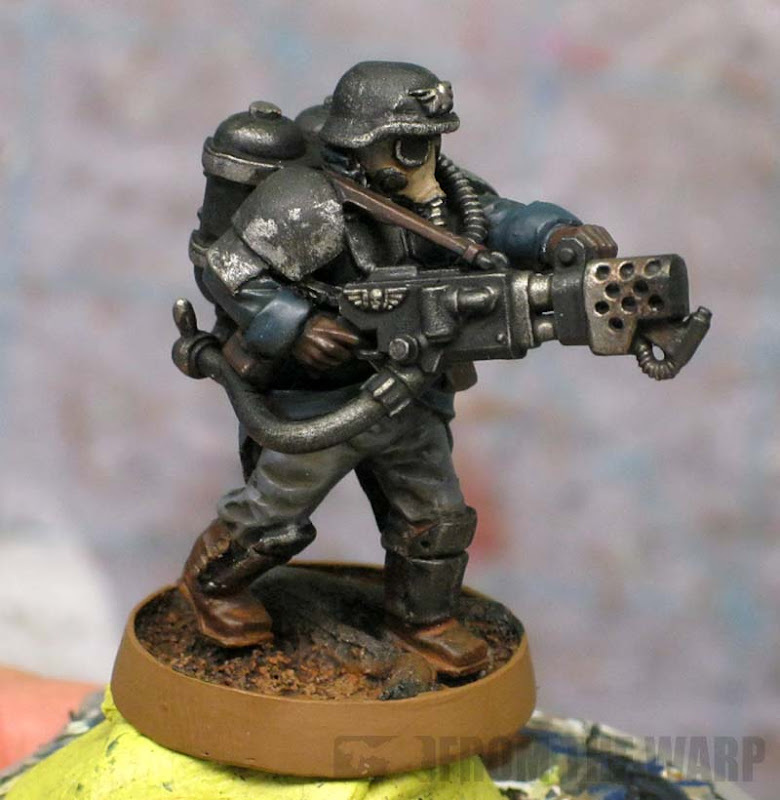 I want to try making a Steel Legion and a Valhallan version. They'll take some work as well, but it would be cool looking. Anon: Thanks, I didn't think about that. agemmanjw: Now that's interesting that you mention the size comparison. I never thought of that aspect. That's a point well worth considering if you were looking to blend IG units from around the galaxy for a combined forces type of army. Very impressive, especially considering how much green stuff work each takes. One of the great things about the hobby and 40k, is that it doesn't have to look like GW's (or FW's in this case) version. Your DKOKs are so nice I started some IG allies for my CSM army using them as a pattern! Great work, sir! Green Stuff Industries: Very cool. It wouldn't take much to turn them into cultists or renegades of some sort.